FRIDAYS: 10:50-11:20 AP MEETING! bring your workbook. AP Chemistry is a course geared toward highly motivated students with interests in chemical and physical sciences as well as any of the biological sciences. This course prepares students to take the AP Chemistry exam toward the end of the academic year. 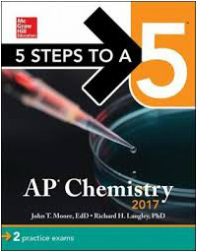 AP Chemistry topics include atomic theory, chemical bonding, phases of matter, solutions, types of reactions, equilibrium, reaction kinetics, electrochemistry, and thermodynamics.